We love and enjoy what we do. Our passion for Chinese medicine comes from a family tradition and having been helping thousands of patients. 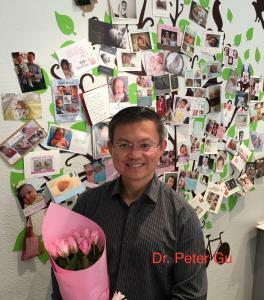 Extensive knowledge and experinces on practicing integrated medicine: Dr. Gu worked as a medical doctor integrating Chinese Medicine and conventional medicine in a prestigious hospital in China before he came to Australia. 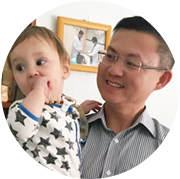 Although DR Gu practices Chinese Medicine, he actually majors in both Chinese medicine and Western medicine. Therefore he possesses the best of both worlds thus has a comprehensive understanding of your health issues which enables him to come up with suitable approach towards solving your concerns. His experience is paramount—22years of professional experience and thousands of patients each year. Dr Gu is a lecturer and reseacher on acupuncture . In our clinic, We strive to improve & extend our clinical reasoning and skill,maintain our approaches in line with current evidence based research and keep our patients’ goals at the centre of our treatment philosophy. How Do I Make an Appointment? Is it easy to book in? To make an appointment for your initial consultation, please call us on 03-95433866. We advice you to call early as possible, for we are very busy. It may take a few days even weeks to get in. We have been in Oakleigh for more than 16 years, and most of our patients are from word of mouth. If you are emergency, or IVF embryo transfer patients, pls let us know. We are committed to accommodate you. Yes, any blood test result or examinations from your doctor’s; your BBT chart or your period record. For the initial consultation and treatment, it may take 1 hour. Subsequent visits about 45 min for treatments. If you come only for herbs, it takes about 10 to 20 minutes. What kind of treatment do I need ? This will be determined when you come to the clinic and will be based upon the diagnosis you will be given.Your opinion will at all times be respected and you will only receive a treatment you feel comfortable with. Acupuncture uses very fine, sterile disposable needles which are inserted in specific points of the body. The needle is as fine as your hair. A mild sensation is often felt but it is seldom uncomfortable.Prior to their first treatment, many people do not believe that acupuncture can be painless. Different sensations such as soreness, numbness, distending, warmth and pressure may be felt, but the energetic sensation differs from pain. People often comment that the feeling is unfamiliar but pleasant and relaxing. Some people have not yet experienced acupuncture. If this is your first treatment and you are wondering what to expect during acupuncture, you may be pleasantly surprised! This is a very common question among those who have never experienced an acupuncture treatment. Acupuncture and Chinese Herbal Medicine treatments are generally considered to be safe but occasionally may be associated with possible adverse reactions in individual cases. Yes, children can receive acupuncture. We have reserved time and space for you. If you wish to cancell your appointment with us, we require at least 24 hours advance notification. Where appointments are cancelled, missed or changed without 24 hour notice, a cancellation fee may be applied. A 24 hour period allows us to rebook this time for another patient who may be on our waiting list for an appointment. We are covered for acupuncture and consultation by over 40 private health funds, including HBF and Medibank Private. If you are covered by a private health insurer, please bring your insurance card and we can claim for you on the spot. . The rebated amount will depend on your insurer or the type of cover you have. How many treatments & how often? Depending on your medical conditions. For acute conditions, you may need two sessions a week, for general conditions, we suggest 1 or 2 appointments per week at early beginning in order to achieve the quickest response from your body. As your condition improves, treatment is reduced to 1 appointment per week or per fortnight. The duration between treatments becomes longer until your condition is resolved and you no longer require treatment. Certain conditions may require treatment to be arranged around the stages and phases of the body (ie. fertility & IVF). Chinese Medicine considers all our physical functioning is associated with our internal organs. When you come in to see us, we may ask you extra questions around your body’s physical condition, including bowel movement, urination, menstruation, sleep, diet, energy levels, stress levels. Further questions and details may be required depending on your individual case. If you are receiving treatment and medications from other practitioners (including your GP), it does not interfere with being able to receive treatment from us. If you are taking medications prescribed by another practitioner please advise us during your appointment with us. We will arrange your treatment to suit. What should I do to prepare for acupuncture? It is best if people are neither hungry nor have a full stomach before having an acupuncture treatment. Loose, comfortable clothing that provides easy access to torso, arms and legs is most desirable. Many people think that they should not schedule an acupuncture treatment when they are sick with a cold or flu, but this is actually a good time to come, since acupuncture and herbal remedies can help speed recovery. Parking is easy, we have car park at rear and unlimited parking in front of our clinic on the service road . Parking and rooms accommodate for any patient with a disability.